Safety and flavor. Ultra fast freezing without losing the flavor and texture of the dishes. A blast chiller ensures the rapid freezing of food, reducing the risk of bacterial growth and making it safer for consumption at a later date. On ArchiExpo, such devices are arranged by properties such as specific application (e.g., for bakeries) or installation. 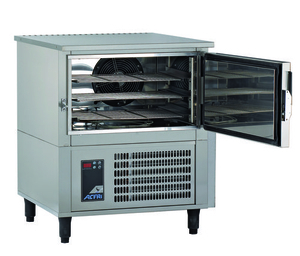 These chillers can be used to preserve prepared food in restaurants and catering or even be used in commercial food production to improve the safety and quality of products such as ready-made meals. They allow food to be prepared more efficiently, lowering labor costs. Options include roll-out trays, specific designs for particular food products and self-defrosting or self-cleaning functions to facilitate maintenance. Ensure that chiller size and capacity are suitable for the volume and type of food to be frozen, and that it is installed in a well-ventilated area. Verify maintenance requirements, which can be alleviated by automatic defrosting or cleaning cycles. Other factors include ease of filter cleaning, energy efficiency and durability in the face of regular use.